The first batch of 2012 data from the LHC has started to be analysed ready for the ICHEP conference in three weeks time so it is no surprise that the first rumours about the Higgs data has surfaced. At NEW Peter Woit revealed his latest information that both ATLAS and CMS are seeing excesses in the diphoton channels at the same places where they saw them last year. The significance is said to be 4 sigma in each experiments for the combination of 2011 and 2012 data. Could this mean the Higgs Boson discovery has arrived? Remember that from last year’s data the local significance with diphotons was 3.1 sigma for CMS and 2.9 sigma for ATLAS. According to the mew rumour the total significance has risen to about 4 sigmas in both cases. This is not yet sufficient to claim a discovery for each experiment independently but the two results together could easily take the combined significance over the 5 sigma line that is required for discovery. Note that this would be the discovery of something consistent with a standard model Higgs boson. More work would be required to show that it has all the characteristics of the particle they were searching for. The total combined local significance across all channels might be expected to be even better but don’t forget that ATLAS had only 2.5-sigma for its combination, and CMS got 3.1 sigma, so even if the diphoton channel provides a discovery the combination may or may not reach 5 sigma depending on what happens in other channels. The rumours are a little vague and may not be completely reliable. If this years peaks are not exactly in the same place as last years then the combined significance could be considerably less. They may insist on using a Look Elsewhere Effect to reduce the significance to a global value. HEP protocol says they can claim a discovery on local significance, but if they want to draw out the game even longer they could still do this. We don’t know how much data had been analysed. They should have about 4.5/fb but due to the processing lag I estimate that both CMS and ATLAS might be looking at something like 3/fb at this time. This might make the 4 sigma seem even better but it also means that it could go down as more data is added. The LHC has been running very well over the last few days and there are a couple more days left before the technical stop with over 6/fb recorded for each experiment and no reason why it should not all be used at ICHEP. If this is the case we will most likely get even better results and possibly even Independent discoveries from each experiment. Credible information tells us that ATLAS and CMS don’t plan to show the combination of the 2012 results at 8 TeV with the 2011 results at 7 TeV. However, I think that if both experiments each have a clear 5 sigma discovery with the combined results they will not be able to resist making the combos, if they have time. See also Dorigo at QDS who is not giving away what he knows as a member of the CMS collaboration but he points out that these levels of significance are about what is expected from the amount of luminosity provided. See also an article on the collider blog questioning the practice of spreading these rumours. For what its worth, I agree that it would be better if no rumours emerged before the conference and I have resisted the temptation to reveal unapproved information from the experiments I have come across in the past whenever I knew it to be private, but once one blog has revealed something like this everyone will see it and follow-up postings like this one do not spread it any further. 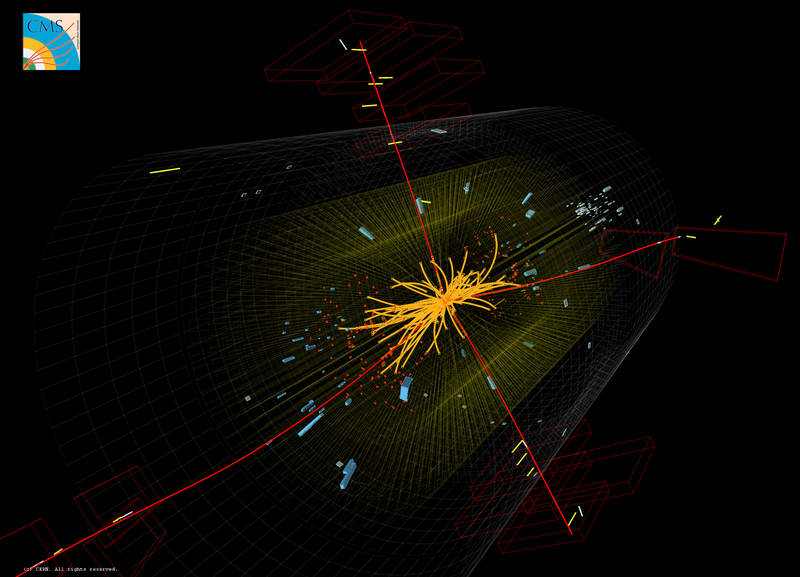 This entry was posted on Sunday, June 17th, 2012 at 5:05 pm and is filed under Higgs Hunting, Large Hadron Collider. You can follow any responses to this entry through the RSS 2.0 feed. Both comments and pings are currently closed. 34 Responses to ICHEP Higgs Rumours = Discovery ? There is the also fact that “signal” is not synonymous with “Higgs”. This difference has been too often forgotten. Two-gamma channel has earlier given a rate which is too large by factor or order two for standard model Higgs and there have been also inconsistencies also in other channels. Before one can speak of – say discovery of standard model Higgs – one must demonstrate that all channels give the predicted rates. Of course, there are enormous pressures for discovering standard model Higgs. This would allow theoretical physicists to keep at least something of their reputation as Masters of the Universe;-). In light of this fuzzy thinking is psychologically understandable. This is sensible and other possibilities may exist. It is interesting that ATLAS keeps showing the fermiophobic Higgs model in the slides as an important alternative. A lot of yukawas going to zero at tree level. Call me old-fashioned but I dont think they will be able to say very much about whether their Higgs is fermiophobic until they have sensitivity to the coupling with fermions, e.g. via decays to bottom quarks or taus. That is still some way off. Allow me to correct myself. A fermiophobic Higgs can still make itself known through bosonic decay channels. Firstly, the dominant production mode involves a top loop which would be suppressed or even eliminated for a fermiophobic Higgs. Also a supression of bottom deacys modes would enhance the other decay modes. The overall effect would depend on the precise model. Indeed it seems that there is not a canonical model we can call “the” fermiophobic Higgs. It could be just a suppresion instead of a zero yukawa coupling. Besides, my heart is divided about the yukawa coupling of the top; either set it equal to one as its mass signals it, or set it equal to zero as the other fermions. I hope that -ph or -ex analysts will consider both possibilities. Yep Philip, sensitivity is low, but production rate is high. If they do not get some signal in the tau channel they will always be embarrassed that the fermiophobic Higgs has better probability that the Standard Model one. By now it is only some tenths of sigma, but what about a SM Higgs scoring 4 sigma level and a fermiophobic Higgs scoring 5 sigma? The ATLAS slides point to this problem. On other hand, it is not a theoretical nightmare. The goal of the Higgs is to give mass to the W and Z. In this context, it is almost forcefull, and even other mechanisms happen to mimic the Higgs. Colaterally, it was noticed that it was possible to use the higgs as mass term for the fermions -Is this idea in the original papers, by the way?- and given that mass is always tricky to think about, it become the mainstream carpet to hidden this muck under. By looking at the blog of Peter Woit one sees how almost everyone identifies “signal” with “Higgs”. Very strange taking into account that many of the commentators probably have a basic education in natural sciences and should have experience about elements of Boolean logic. Maybe the media sensationalism related to Higgs has destroyed the ability to think in terms of facts. It would be a discovery of “something consistent with a standard model Higgs boson”. The distinction is a well-known subtlety that is really not worth getting too bothered about. Sentences get unwieldy if we have to use such exactitudes in every statement. Well, it could be a five sigma rejection of SM background only without being consistent with an SM Higgs. Video comment: Imprints of Higgs’ hands? Kibble went to Edinburgh for undergrad and PhD. Maybe the school will at least do a imprint of his feet. I agree that this is the sensible way of presenting the potential Higgs discovery at ICHEP. However, the distinction you talk about is far from being a “well-known subtlety”. The public at large is unaware of the requirements related to a solid discovery claim: matching expectations on decay/production rates, angular distributions, branching ratios must be proven out before claiming full consistency with SM predictions. Many are also unaware that finding the Higgs alone may not shed light on the many open questions posed by SM. In particular, the naturalness problem will remain outstanding if low-scale SUSY refuses to show up. I never claim to be writing this blog for “the public at large”. Most people who come here have enough knowledge to understand the subtlety involved and those who don’t will probably find better places to have it explained. Please don’t interpret my criticism in the wrong way. I am not trying to put you on the spot. I am simply concerned that there is excessive hype nowadays on blogs which makes lots of people jump to premature conclusions. We should not misinterpret what was said. F.ex. in the article by Dorigo happens just an avaliation of the accuracy (or mean error) which, after soundso hours working or soundso many 1/fb data, calculated values for Higgs will have, however, not how may be the value. F.ex. if you want to determine a parameter suposed to be 1,00 if a theory is correct, you can guess, more or less, from the unvertainty of one measurement, and from the connection (corellation) between the measured values and the to-determine parameter, that the result after one year will be precise to (saying) +/- 0,4, after four years data to +/- 0,2 and so on. But you can’t guess the value itself, i.e. it can come out 1,00 +/- 0,2 , but also 0,0 +/- 0,2 (or even negative values). Thus, the prediction of the precision with growing data is rather trivial. To conclude that “Nature has spoken” on basis of some rumor that some blogger has claimed to have received, is quite too hasty a reaction. These are not subtleties, far from them. We only know that a new physics is required at these energies and that we must must understand the massivation of particles. We should not forget that Higgs provides a purely phenomenological parametrization based on putting in the actual masses, nothing more. Therefore one has excellent reasons to be skeptic about the existence of Higgs but not about finding some new physics. As Lubos told at http://motls.blogspot.fi/2012/06/fermi-130gev-line-claimed-to-reach-5.html there is 5 sigma evidence for gamma ray signal from inner galaxy around 130 GeV interpreted in terms of annihilation of 145 GeV pair of dark particles to gamma pair (rather than 130 GeV as the naivest guess would be). There is also some evidence for signal around110 GeV. Simple extrapolation from 145-130 to something-110 GeV would suggest annihilation particles with mass 125 GeV to a gamma pair. Higgs of course cannot be involved since weak interactions are indeed weak. But what about strong interactions? Nobody has claimed that “Nature has Spoken”. It is very dishonest to put something in quotes when nobody has said it. Nobody has even said anything vaguelyequivalent to that. My article is just as cautious as that of Prof Strassler, perhaps even more so because I have listed more points about why we need to be cautious. I also used the phrase “discovery of something consistent with a standard model Higgs boson” so I am aknowledging that if something is confirmed then it could fit non-standard models. It may even fit non-standard models better depending on the size of excesses. Nothing I have said indicates otherwise. I have certainly not said that this is or even would be a discovery of the Higgs Boson. Matti said “… 125 GeV bump … A possible TGD based explanation is as pion-like states …”. if it looks as though the cross section is larger than expected for a single Standard Model Higgs. I would like to see (but I do not expect to see) a realistic evaluation by the people at CERN of models such as Matti’s and mine in light of the actual data. Phil, I am not speaking about your article. In Peter Woit’s blog one of the comments was “Nature has spoken!”. SLAC claims that BaBar Data Hint at Cracks in the Standard Model. The excess decays have to be confirmed, but they claim that current data already rules out the Two Higgs Doublet Model. Yes it sounds promising, but these are the kinds of result that come and go. If it is replicated and increases in significance it will be more exciting. Juan Ramon—As an author of a big review article on Two Higgs Doublet Models, I was pretty outraged by that sentence in the BaBar paper. If the data is confirmed, the Standard Model is ruled out, and all they say is that the type II 2HDM does not fix it. It’s like saying “extra Z models won’t explain the excess, therefore all extra Z models are ruled out”. It’s still a very important result, but Phil is right….we need to see if it is replicated. Is there room for an Extended SM (ESM) model with a massless Higgs? Classical gravity could emerge as a dual (Higgs-Graviton) description of Lesage gravity. EM forces could emerge as dual (Higgs-Photon) interaction. Then we even could describe ESM particles as geometrical microscopical string-like entities able to merge into Quarks. I am not sure I want to get into a long discussion of your theory but the most immediate problem for a massless Higgs would be that it would be produced in vast quatities as a way of radiating heat from any massive material, just like photons except that no electric charge is required because the Higgs couples to everything with mass. They would also be stable because massless particles cannot decay in the vacuum due to energy and momnetum conservation so the universe would be full of them and they would be easily detected. My universe is indeed full of oscillating massless Higgs particles, coupling to mass by changing its “flavor” (like neutrinos) into gravitons or EM photons by real collision influence with fermions and the origin of the “eigen energy”of fermions.. If by a local energy excess (e.g. a black hole horizon), two Higgs particles collide with enough energy, it is assumed that an Electron and a Positron emerges by the mutual transformation (decay) of the two Higgs particles. Function Follows Form (Q-FFF theory) means that all particles even neutrinos got their qualities by a real microscopic particle FORM derived from the Higgs form. Due to the propeller shape of the Fermions, these Fermions start to spin by a constant collision and scattering process with the Higgs vacuum, changing Higgs particles continuously into different forms of Photon/Gluons and Gravitons. It seems that Higgs has taken a social role that football teams have. Blog reader and writer can decide: to be a fan of Higgs or not. I dot like football or team sports in general, and being a fan is even less for me. For me this is more about truth than about whether my pet team wins. Quite objectively one can say that at this stage the belief that Higgs has been discovered, is very unscientific and highly emotional attitude. I have read quite many wrong rumors from blogs during last two years, and I see rumors only as an easy manner for a blogger to his personal web status. If the rumours are bourne out then the scientific evidence for a new scalar boson will be overwealming and it is already pretty good based on earlier results. It will take more data to determine how well it fits the profile for the standard model Higgs Boson but the match is good so far. To say that this is a fan mentality and unscientific is rediculous. Your comment about past wrong rumours is curious because every time one surfaced you have been happy to explain to us how well it fits your theories. Most of the bloggers have been skeptical but open minded about many of them. It is right that they should be reported and discussed. To say that bloggers are just trying to promote their personal status is just churlish. Outreach is something to be encouraged. Any compelling evidence for a signal at LHC, whether a scalar boson consistent with SM or some other resonance, ought to be celebrated as a major step forward. High energy physics is often criticized for being stagnant for the past two decades or so and an important discovery will likely shift this negative perception. I began by writing the following email to America’s Discover magazine (it was about an article of theirs concerning Julian Barbour). Unintentionally, my email started talking about a subject which fascinates me – the Higgs boson/field (I’ve been thinking about this for years, and I spent hours deciding on the best words to use in a short email). I used Albert Einstein’s theories to come to the conclusion that what we call the Higgs is our name for ALL particles (not simply this one or that one) being composed of quantum mechanical “wave packets” formed by the union of gravitons and photons – the notion of the Higgs actually being all particles implies that its possible discovery by the Large Hadron Collider would be another experimental verification of the existence of quantum entanglement in time and space and on Earth. In turn, gravitons and photons – along with all time and space – are composed of electronic binary digits (this may be termed the Higgs field). * I suspect this idea of binary digits composing space-time is highly unfashionable in the present worldview of quantum fluctuation. Also, people believe in strictly linear time where effects do not influence causes, but the “binary digits” idea requires a looping subroutine where electronics from the future is transmitted nearly 15 billion years into the past in order to create the subuniverse we currently inhabit (on a separate note, I believe we live in an infinite universe made up of subuniverses shaped like figure-8 Klein bottles that are made flexible enough to seamlessly – except for wormholes – fit into each other by their construction from binary digits). Dark matter could be explained as matter travelling from future to past, or past to future, which is invisible but still has gravitational effects. Dark energy could be explained as gravity or space-time (i.e. the product of binary digits) being programmed to accelerate and expand (I prefer to regard acceleration/expansion being the result of more space-time continually being created, which is what the Big Bang’s rival – Steady State theory – proposes). Anyway, the unfashionableness of my ideas does not automatically make them wrong. * The University of Edinburgh scientist Peter Higgs pointed out that the Higgs field would produce its own quantum particle (the Higgs boson) if hit hard enough, by the right amount of energy. The Higgs field is the name given to the unification of space-time by the binary digits creating it. Therefore, the Higgs boson would necessarily indicate this unification and “…its possible discovery by the Large Hadron Collider would be another experimental verification of the existence of quantum entanglement in time and space and on Earth.” Why does data from the LHC “… see tantalising hints consistent with making Higgs bosons with a mass of around 125 times as heavy as the proton?” (http://www.ph.ed.ac.uk/higgs/laypersons-guide) I don’t know why there are hints at this specific mass. I can only suggest that we use quantum physics’ wave-particle duality and think of all the subatomic particles in the universe – and throughout all time – as a beam of light from a torch. If the circle of light cast by the torch represents all subatomic particles, then the centre of that circle (which is its brightest part) represents the masses’ energy of 125 billion electron volts (125 times as heavy as a proton). I’d like to comment on the article “Is Einstein’s Greatest Work All Wrong—Because He Didn’t Go Far Enough?” by Zeeya Merali (March 2012 issue). This makes sense as long as we assume that space-time is an unverifiable abstract grid and matter, such as objects, is the only component of reality. Einstein’s thinking claims that space-time is as much a part of reality as matter is, and his thinking can potentially be verified by the Large Hadron Collider. This is because the Higgs boson/field sought by the LHC could turn out to be a non-Standard-Model Higgs where subatomic particles are composed of quantum mechanical “wave packets” formed by the union of gravitation’s gravitons. To give matter a different appearance from gravity, this union could include electromagnetism’s photons. The amplitude of gravity waves might taper from a central point to the sides while the amplitude of electromagnetic waves remains constant – in which case electromagnetism would be modified gravitation and Einstein would have been correct when he said gravitation and electromagnetism may be related. Since the great physicist claimed gravitation is the warping of space-time, time and space would have no separate existence from matter and would be the ultimate composition of the non-Standard-Model Higgs particle. Continuing from Einstein’s deductions, space-time cannot simply be an abstract background but must be composed of something, or else it could not give rise to the matter we see, touch, and probe with instruments. But that something also gives rise to immaterial space, time, and gravity. What could be the source of things we see, and also of things we do not see? Why not the electronic binary digits of 1 and 0? After all, we can view a webpage but can never view its ultimate composition. So Julian Barbour’s approach is only good for people who only believe in what they can see. Albert Einstein’s approach is the one to follow if we ever hope to achieve a Unified Field Theory or Theory of Everything which has meaning in physics, as opposed to purely in mathematics. A mathematically defined unified field could be accurate and detailed, but it would only be relevant to mathematicians and would therefore be somewhat abstract. A physical unified field would be relevant to everybody, enabling us to understand and manipulate both what we can and can’t see in the universe.